George Haines was born on 7 January 1864 in Steventon, South Australia , son of Henry Haines and Kezia Elizabeth Flavel. He died on Tuesday, 25 January 1921, aged 57 years and 18 days, in Dimboola, Victoria, Australia . Herbert Haines was born on 12 March 1866 in Steventon, South Australia , son of Henry Haines and Kezia Elizabeth Flavel. In September 1893, Herbert, aged 27, married Harriet Edwards, aged 21. He died on Wednesday, 10 February 1926, aged 59 years, 10 months and 29 days, in Footscray, Victoria, Australia . 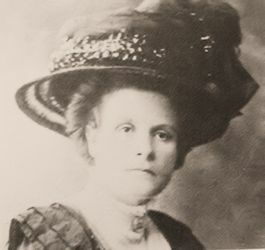 Eva Haines was born on 6 July 1868 in Steventon, South Australia , daughter of Henry Haines and Kezia Elizabeth Flavel. Caleb Haines was born on 25 May 1870 in Tea Tree Gully, South Australia , son of Henry Haines and Kezia Elizabeth Flavel. Polly Haines was born on 4 April 1872 in Tea Tree Gully, South Australia , daughter of Henry Haines and Kezia Elizabeth Flavel. About 1892, Polly, married Edwin Gooding, son of Thomas Gooding and Elizabeth Tregeagle, in Victoria, Australia . She died on Saturday, 12 December 1959, aged 87 years, 8 months and 8 days, in Dimboola, Victoria, Australia . Ella Haines was born on 19 May 1874 in Tea Tree Gully, South Australia , daughter of Henry Haines and Kezia Elizabeth Flavel. Emma Ruth Haines was born on 27 May 1876 in Houghton, South Australia , daughter of Henry Haines and Kezia Elizabeth Flavel. She died in 1972, aged 95 years. Harry Haines was born on 29 November 1878 in Tea Tree Gully, South Australia , son of Henry Haines and Kezia Elizabeth Flavel. He died in 1965, aged 86 years. Edgar Haines was born on 28 January 1883 in Tea Tree Gully, South Australia , son of Henry Haines and Kezia Elizabeth Flavel. He died in 1962, aged 78 years.